If you haven't yet dropped by the Magnum Pleasure Store at Yonge and Bloor, then you probably should before it closes its doors on August 30th. 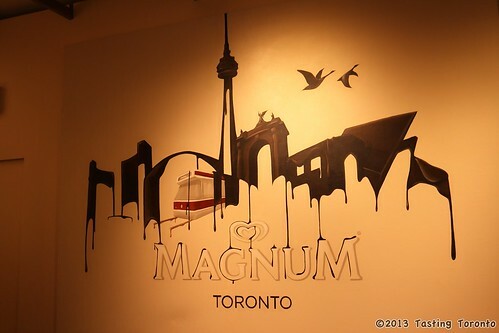 The store at 11 Bloor Street West is Magnum's first North American pop-up custom ice cream parlour. It was supposed to close last month, but due to overwhelming consumer demand, has stayed open a little longer. Line-ups on the street take almost an hour prompting many passers-by to scratch their heads wondering why people would queue-up for a $6 ice cream bar. Upon ordering your Magnum, you get a choice of Vanilla or Chocolate ice cream to be dipped in a white, classic, or dark chocolate shell. Next comes a selection of 21 toppings, from your luxurious maple fudge to more exotic rose petals, to wacky popping candy, and even bacon! To finish things off, you get a choice or white, classic, or dark chocolate drizzle. Feeling adventurous, I asked for a chocolate ice cream bar, dipped in white chocolate, topped with popping candy (Pop Rocks), Nerds, rose petals, and honeycomb. Though they appear to have run out of honeycombs, so it was just drizzled with honey. I must say Pop Rocks on an ice cream bar is quite and interesting sensation! As you can see from above, it looks like the 60's threw up on my ice cream. It was quite tasty, though a little heavy on the Nerds, which kind'a overwhelmed the other flavours. 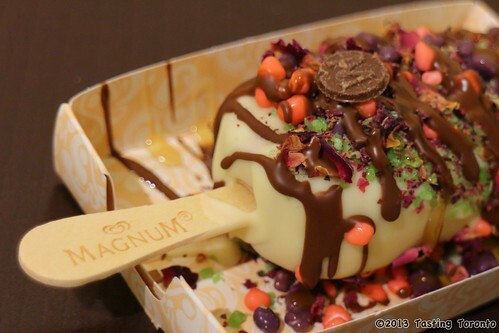 All in all the Magnum Pleasure Store is a fun and novel experience to try at least once. But personally, all this bespoke treatment can't hold a candle to Magnum's grocery bought Double Caramel.